This felt like a slow burn kind of book. You start reading, not sure what is going to happen, all the while it is working its way into your brain like a song you cannot get rid of, then BAM - you are hooked and all you can think about is, "WHAT JUST HAPPENED?!" This is the story of Errin, the sister of Lief, and how she struggles to take care of her mother while trying to take care of herself. Her life is as hard as hard can get. Most of her family is gone or dead, except for her mom who is suffering from an unknown illness. Errin has been trained as an apothecary so she is able to make a minor living selling illegal herbs, potions, and poisons. She is doing her best to keep a low profile when she crosses paths with Silas, a mysterious man who buys potions from Errin from time to time. 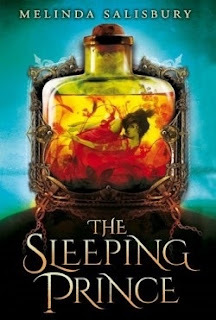 When the Sleeping Prince is pushing forces into the small town Errin and her mother have taken residence in, Errin is forced to leave what little she has behind and travel far across the kingdom for safety. Errin finds herself back in her hometown where everything starts to unfold and what she thought was true isn't. She finds herself involved in something much, much bigger than herself and the decision she makes could have a massive affect on the entire kingdom. When this book started, I wasn't sure if I was really reading the second book in the Sin Eater's Daughter series. Errin had never been introduced, nor anything about this quiet town or even Silas himself so I was rather confused. Once or twice the Sleeping Prince was mentioned and slowly... very slowly... things started to come together. Histories were explained, the puzzle pieces started to fit, secrets started to be revealed, and then you get hit with the full force that is the greatness of Salisbury's writing talent. I quickly grew to love everything about this story - the characters, the world building, the mystery... all of it. How it came together was just bloody brilliant. I didn't find myself bored or twiddling my thumbs at any point in this book, I was so captivated at Errin's need to save her mother and her quest across the kingdom that this book was over before I knew it. AND THAT ENDING - OH MY STARS. Please, add this to your TBR, pre-order, borrow from the library - whatever you do - get your hands on this book. There was no middle book syndrome here, Salisbury does not play that way. That is why I gave this book 4.5 stars. So I beg you, I want someone to fangirl with so please read this book.